This firmware upgrade also contains modifications in the past upgrades as follows. Fixed the Dual-tone multi-frequency (DTMF) problem: previously, if you called a phone number and entered options (e.g. Press 1 for inquiry, Press 2 for support etc. ), the keys were ignored. Fixed the Ringing problem: previously, when you were using SkypeOut to call a landline/mobile phone from S0-20, sometimes the other person heard the ringing still continuing even though he or she had already picked up the phone. Improved the Power off function: previously, when you pressed the hang-up key followed by selecting the "Switch Off" menu, S0-20 might not have responded well. The LCD screen now always turns off according to the Time out setting, including when the battery is being charged. The country name for the United States Minor Outlying Islands (country code +1340) is fixed. Reduces the amount of echo noise which might affect call quality in some cases. If you want to check your S0-20's firmware (software) version, go to the Settings menu and select About. There are four different upgrade files according to your S0-20's hardware version. Follow these steps to determine and download the correct upgrade file package. In your S0-20, go to the Settings menu and select About. Scroll down the screen until you can see the Hardware Version. Click one of the links below to download the firmware upgrade package that applies to your S0-20. Continue with the Upgrade procedure below. Firmware upgrade will reset all your user settings in S0-20, such as wireless AP and its password. You may want to note them down before the upgrade. The upgrade procedure takes a number of steps to complete. You may want to print the below procedure before the upgrade. DO NOT disconnect the USB cable or shut down the upgrade program until the upgrade is completed. The whole process will finish in 25 to 30 minutes. Unzip the firmware upgrade package into your PC. You will find the following three files. Power S0-20 off if it is powered on. Connect S0-20 and your PC by the USB cable. Press the Call key and Hang Up key together and hold them down until S0-20 activates. One of the following message will appear on S0-20 screen. If you see this screen, continue with step 6. If you see this screen, jump to step 9. The OS will detect S0-20 and will ask you for driver installation. Manually select the folder which includes the downloaded S0-20 driver files, and proceed the driver installation. A Serial Interface driver named "GadgetSerial" will be installed in your PC. 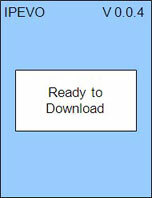 The S0-20 screen message will change into "Ready to Download." 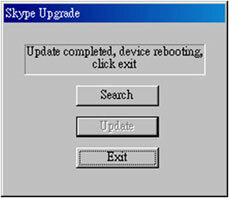 Run the firmware upgrade program, UpgradeClient...setup.exe. The program interface shown below will appear. Click 'Search'. 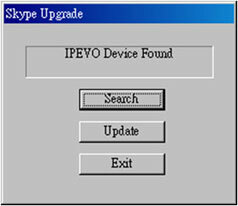 The upgrade program will locate S0-20 and show 'IPEVO Device Found' message. Click 'Update'. The program will start upgrading the firmware. 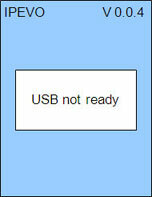 DO NOT disconnect the USB cable or shut down the upgrade program until the procedure is completed, which will take approximately 18 minutes. When it is completed, the followings will occur. S0-20 will reboot automatically and will enter Initial Setup (language selection). The upgrade program will show the upgrade has completed. Click 'Exit' to close the firmware upgrade program and disconnect the USB cable from S0-20. After reconfiguring S0-20, go to the Settings menu and select About to see the product information. 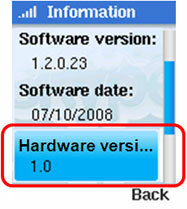 The Software ( = firmware) will be upgraded to version 1.2.0.31. Fixed the invalid number problem which may occur when dialing in some nations. Make sure your computer will not enter Sleep mode while you are upgrading the firmware. If you are using MacBook, MacBook Pro, or MacBook Air, make sure your computer is plugged to an AC power supply during the upgrade. Unzip the firmware upgrade package (S020FWUPG.app) into your Mac. Connect S0-20 and your Mac by the USB cable. The following message will appear on S0-20 screen. If a popup window appears on your Mac saying a new network interface has been detected, click Cancel. Double click the S020FWUPG.app. The firmware upgrade program will appear. Click Upgrade. The firmware upgrade will begin. When the upgrade is completed, a completion message will appear. Click Ok. The firmware upgrade program will shut off. I cannot sign in to my Skype account using S0-20. Microsoft has officially ended its support for Skype standalone phones as from July 2017 (https://support.skype.com/en/faq/FA34763/which-skype-enabled-devices-or-platforms-are-no-longer-supported). However, you can still use your Skype account and Skype Credit on supported Skype platforms such as personal computers and smartphones. What other Skype Services are available through the S0-20? Or is it only for Skype-to-Skype calls? 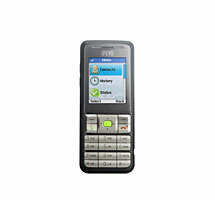 You can make SkypeOut calls, make use of your SkypeIn subscription and access your Skype Voicemail using the S0-20. However, you must purchase Skype credits for your account prior to using these services on the phone. The phone will display your Skype credit amount. Can I use the S0-20 when traveling between different locations in the same way as mobile phones? It is not advisable, since the wireless signal strength can vary between locations, even if it is an area-wide Wi-Fi service. The S0-20 performs best in a fixed location that provides a reliable and strong wireless network access point. How do I import my contact list onto the S0-20? All of your contacts associated with your Skype ID will be loaded onto the S0-20 when you sign in to Skype on the phone. Because contacts are now stored centrally on Skype's servers, the contacts will be automatically added to your Skype Wi-Fi Phone. What languages does the S0-20 support? I have Skype contacts from different countries. Will their contact information be displayed correctly? The user interface and menu currently supports English, Chinese (Traditional or Simplified) and Japanese. The available language fonts for your Skype contact list also include these languages, plus it will display most European languages correctly. Is the S0-20 only for registered Skype users? No. In fact, you can even use the S0-20 to register for a free Skype account. If you are an existing user of Skype, you can simply use the same Skype name and password to sign into the Skype service, regardless of the version of Skype you were using on your computer previously (Windows, Linux or Mac OS X). Where can the S0-20 be used? Anywhere, as long as the location is within range of a secure or open wireless network. However, since the Wi-Fi phone for Skype does not have any web browsing capabilities, it will not be able to access Wi-Fi hotspots that require web-based login or authentication. Do I need to download the Skype software to the S0-20? 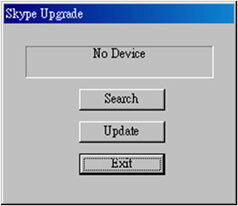 How do I make sure I have the latest version of Skype on my phone? The S0-20 comes pre-loaded with Skype, so all you need to have is access to a wireless network connection and a Skype ID to start using the device. 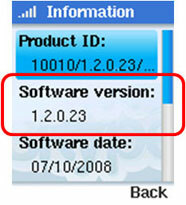 There is an option to automatically update the software to the latest version, or you can do this manually. This way, you can choose the version of the software you want running on the Wi-Fi phone. Does the S0-20 Wi-Fi phone for Skype operate completely independently from my computer or laptop? Yes. IPEVO’s Wi-Fi phone for Skype is designed to be operated without the need to switch on your computer or laptop. It has the Skype software build into the device, it is battery powered (and comes with a charging cradle), and it accesses the Internet through a wireless network access point. Is there a way to record a voicemail greeting on the SO-20? Yes, you can record a voicemail greeting on the S0-20 or on the Skype software. The recorded greeting will be uploaded to the server on the Internet and will be shared with all Skype interface (device, software). Record once, and use it everywhere. Go to Menu > Settings > Call Divert > Welcome Message > Options > Record New. Go to Tools > Options (Windows) or Skype > Preferences (Mac). Go to Calls > Voicemail. I have a Skype WiFi phone that looks exactly like S0-20. If it is from IPEVO, can you offer a firmware upgrade? Your phone might be one of the following two models from other companies. Although these two devices and S0-20 share the similar structure and functionalities, they are not compatible with each other. Please contact its original maker for customer support. Is the battery BL-5CT from Nokia compatible with S0-20? Although we haven't tested BL-5CT, our logical conclusion is NO, because the list of mobile phones compatible with BL-5CT and that for BL-5C do not overlap at all. Can I have a conference call on S0-20? You can join a conference call initiated by other person using S0-20. Here is one such scenario. Your friend is having a Skype call with another friend of yours. Your friend add you to the call from Skype's computer interface. You will receive the call on your S0-20. You can join the conference call with your two friends. You cannot initiate a conference call from S0-20. Press the Call key (the green phone icon). The keypad will be locked and an icon will appear on the screen. The keypad will be unlocked and the keypad icon will disappear. Does S0-20 support SIP (Session Initiation Protocol)? No, S0-20 does not support SIP. For other technical specifications, please refer to the S0-20 spec sheet. What do all the screen icons mean? Here is the list of S0-20 screen icons and their meanings. Network Alert: indicates one or more subscription service (such as voicemail) is going to expire soon. Ringer Off: indicates the ringer sound is turned off. To turn the ringer on or off, long-press the "#" key. Microphone Mute: indicates the sound input is muted (during the call). To mute or unmute it, during a call select Option > Unmute from the menu. Missed calls: indicates there are new missed calls. To view the details, go to Menu > History > Missed Calls. New request: indicates there are new contact requests. To view the details, go to Menu > History > Contact Requests. New Voicemail: indicates you have new voicemails. To listen to them, go to Menu > History > Voicemails. I cannot hear ringtones when receiving a call. Active Mute: if a slashed musical tone icon appears on the screen, your phone is in the active mute state (i.e. no ringtones). To disable it, long-press the "#" key. Call alert setting: go to Menu > Settings > Tones > Call alert and make sure it is not "Off." Ring volume setting: go to Menu > Settings > Tones > Ring volume and make sure it is not "0." To increase the ringtone volume, you can also press the Volume Up key on the side of S0-20 from the main screen when you are not talking on the phone. I want to change the country code. Setting the country code allows you to dial numbers inside that country without prefixing the country code when you are using Skype Out. You may select a country during the initial setup. If you want to change it, go to Menu > Settings > Call Settings. Can I use S0-20 at any Wi-Fi hotspot? S0-20 does not support web browsing, and therefore cannot access Wi-Fi hotspots that require web-based login or authentication. This prevents S0-20 from being used in conjunction with software such as Boingo, which allows you to access Wi-Fi hotspots on the run. In addition, S0-20 was originally designed to be used in private, indoor locations such as homes and offices. When used in a large-scale public area, the connection sometimes becomes compromised due to special wireless router settings, weak signals, etc. How do I create an ad-hoc wireless network for the S0-20? The following instructions are intended for people who want to use S0-20 in an environment with no available wireless network. I can't connect to my wireless router. There is a known compatibility issue with some of the wireless routers on the market. Here are some suggestions for resolving it. Avoid 802.11-n. S0-20 is compatible only with 802.11 b/g. If your 802.11-n router can force itself to select 802.11 b/g, please do so and see if it connects to your S0-20. Go to Menu > Settings > Network > Preferred networks > Options > Add network manually. Select WPA or WPA2 as the security encryption, not WEP. I cannot enter an extension number. When you use S0-20 to call a phone number and enter voicemail options after the call went through (e.g. Press 1 for sales, Press 2 for support etc. ), the keys might be ignored. This is a known technical issue regarding Dual-tone multi-frequency (DTMF). It can be solved by upgrading the firmware to the latest version. Can you suggest a compatible headset for the S0-20? We suggest the HS-47 from Nokia (Link to Amazon.com). To be compatible with S0-20, the headset needs to have a 2.5mm jack with four contacts. My settings are gone whenever my battery drains completely. How can I fix that? When the battery runs out completely, the settings information will be deleted because in order to retain that information, S0-20 needs a small amount of power. To prevent this issue, we suggest you always put your S0-20 on the cradle for charging when not in use. What is a compatible battery for the S0-20? Nokia BL-5C is a compatible battery, available via Amazon.com. S0-20's battery runs out very quickly. Upgrade S0-20 firmware to the latest version. If the firmware upgrade does not work or the firmware has already been upgraded, the battery might be the problem. I cannot receive voicemail on S0-20. Go to Skype.com, log in with your account information, and subscribe to or enable the voicemail service. In your S0-20, enter Menu > Services > Skype Voicemail and see if the Voicemail subscription status is correctly displayed. Enter Menu > Settings > Call Divert > Voicemail and enable the voicemail option. If you still cannot hear voicemail afterward, reset your S0-20 and try again. Menu > Settings > General > Reset > Reset All. My S0-20 does not turn on. Take out the battery, put it back in, and press the Power (Hang Up) key again. If that doesn't help, charge S0-20 for 30 minutes and then press the Power key. If the charger is not working, try connecting the USB cable directly into S0-20, or try charging S0-20 with a standard USB mini cable to charge it through your computer. The voice/ringtone volume is too low. If the call volume is too low, keep pressing the Volume Up key on the side during a call. Increase the ring tone volume. You may either press the Volume Up key on the side when you are not making or taking a call, or go to Menu > Settings > Tones > Ring Volumes and increase the volume. From the same settings menu, select a different type of ringtone. There is echo during calls. Please update the firmware to the latest version. Sometimes echo occurs when the sound volume is too high. You may try adjusting the volume using the volume key.